ON THIS DATE (October 1, 1967) ... The Red Sox are in the World Series after beating the Minnesota Twins, 5 to 3, in the final game of the American League season. 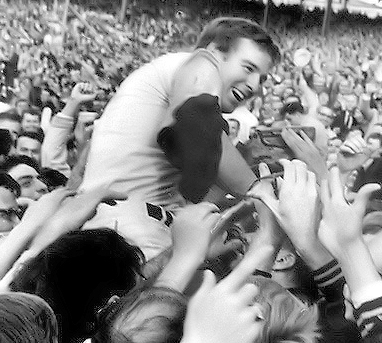 Carl Yastrzemski won the Triple Crown and Jim Lonborg won the biggest game of his career. The game was won in the sixth inning and Lonborg himself started it with a 50 foot bunt down the third-base line. Minnesota pitcher, Dean Chance, had blanked the Red Sox until then. But once Lonborg beat out the bunt, the 35,770 fans started to go crazy. The Twins had scored a run in the first inning, as Lonborg pitched around Harmon Killebrew, with two outs, walking him on four pitches. 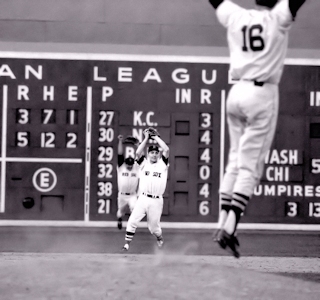 But then Tony Oliva drilled a drive to left and the ball bounced off the wall above Yastrzemski's leap. Third-base coach Billy Martin saw what was happening and waived Killebrew around third. The throw came toward the plate and George Scott cut it off and threw wildly to catcher Russ Gibson's left, allowing Killebrew to score the first run of the game. In the third inning, with two outs, Cesar Tovar worked a base on balls and Killebrew slammed a single to left-center. Yaz tried to make a quick play on the ball to hold Tovar at second, but the ball went by him to the wall and Tovar scored, making it 2 to 0. Then came the all-important sixth inning. Lonborg saw that Tovar was playing him back at third and decided to try to bunt, because Chance had thrown him all fast balls in his first at bat. It worked. The ball bounced between the mound and third. Chance was not able to get to the ball and Tovar grabbed the ball and fumbled it. With Lonborg on first and the crowd chanting "Go Go Go", Jerry Adair singled through the infield to center, moving Lonborg to second. Dalton Jones bunted the first pitch he saw, foul and then pretended to bunt again. As the Twins infielders broke in toward him, he pulled the bat back and lined a single to left, to load the bases for Yastrzemski. As the crowd was screaming louder and louder, Yaz responded by lining a single to center and the score was tied at 2-2, with Yaz on first and Jones on third. Ken Harrelson was next and worked the count to 3 and 2. Chance broke a fastball in on his fists and he bounced a high one to Zoilo Versalles at second base. By the time the ball came down there was no play to be made anywhere, but Versalles tried to get Jones, heading for home. The throw was late and Dalton scored. The Sox were now up, 3-2, and that was it for Chance. Al Worthington was brought in to face Scott and threw a pitch in the dirt, that moved Yaz over to third and José Tartabull, who was running for Harrelson, over to second. And then he threw it in the dirt again. 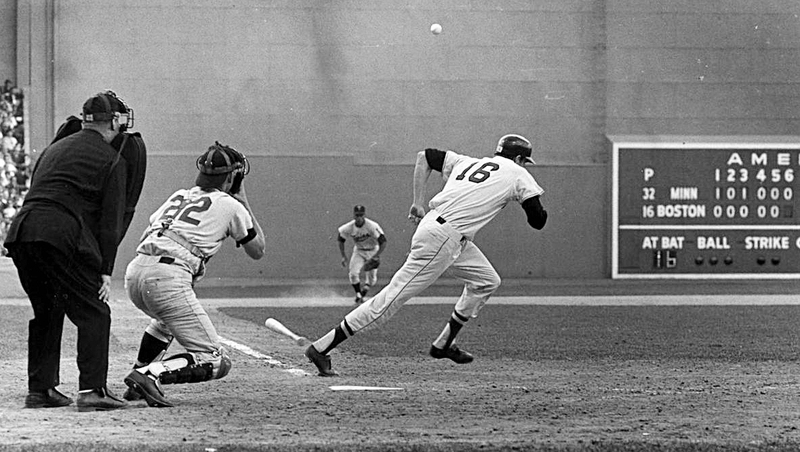 As the ball got by catcher Gerry Zimmerman, Yaz scored the fourth run. Worthington finally struck out Scott, but walked Rico Petrocelli. Then Reggie Smith hit a hard one down to Killebrew, at first, that bounced off his leg and Tartabull scored the fifth run of the inning. Norm Siebern pinch-hit for Gibson and grounded out. Lonborg, who started the rally with a little bunt, came up for the second time in the inning and ended it with a pop up, but the Sox were up by two runs, 5-2. Lonborg erased the Twins in the seventh inning, but in the eighth he ran into trouble. Rich Reese pinch-hit for Versalles and lined a single to center. Tovar hit a grounder to Jerry Adair, at second, who tagged Reese coming down the line and threw to first to complete a doubleplay. Jerry got seven stitches in his leg for his effort and limped off the field. That doubleplay proved to be important because Killebrew and Oliva then both singled. Bob Allison was next and hit a soft liner down the left-field line into the corner that scored Killebrew. Oliva stopped the third and Allison decided to try for second. But Yaz threw a strike to Mike Andrews, who had replaced Adair at second. Allison tried to slide around Andrews and went by the bag. As he reached back, Andrews got him for the final out. It was another clutch outfield play by Yaz. It now came down to the ninth-inning and Ted Uhlaender led off with a ground ball down to Petrocelli. The ball took a funny hop, bounced up and struck Rico under the right eye. Uhlaender was safe at first, but the next batter, Rod Carew hit a ground ball to Andrews, who tagged Uhlaender and made the throw to Scott. It was in the dirt, but George one-handed it for the double-play. The last batter was Rich Rollins and he popped up to Petrocelli to end the game. It was over and the players made a mad dash from the dugout. There were fans rushing onto the field as Andrews and Scott boosted Lonborg aloft on the mound in what had to be the wildest sports scene in Boston history. But there still was a game going on in California. The Tigers needed to win both games of the doubleheader to have any chance. They had won the first game, 6-4, and three hours later they were erased from contention by the Angels, 8-5. The Red Sox had won the pennant.